Song is insect-like, high-pitched, rising and falling “zi-zi-zi,” repeated 6-12 times. 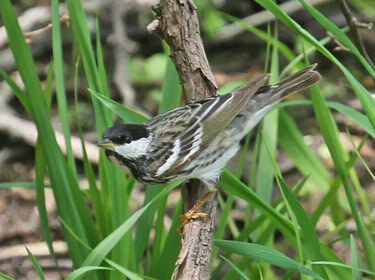 Description: Male has solid black cap; white cheeks; back is boldly streaked with black; white below with black streaking; white undertail coverts; and two white wing bars. 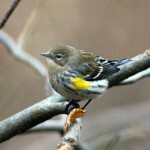 Female is duller overall; slightly greenish above; streaked crown and back; underparts sometimes washed with yellow; lacks black crown and white cheek patch. 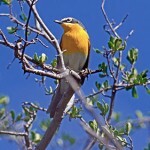 Habitat: Migrants found in tall deciduous trees such as cottonwoods, and in streamside forests. 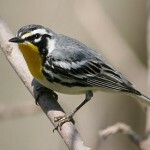 Where in Nebraska: Common spring migrant, uncommon west, rare fall migrant statewide. Field Notes: Nests in northern coniferous forests. Fun Facts: Part of the fall migratory route of the Blackpoll Warbler is over the Atlantic Ocean from the northeastern United States to south America. This route averages 3,000 km (1,864 mi) over water, requiring a potentially nonstop flight of up to 88 hours. To accomplish this flight, the Blackpoll Warbler nearly doubles its body mass and will burn fat as fuel. If they were burning gasoline instead of fat, they’d be getting about 720,000 miles to the gallon. During this arduous trek, they will beat their wings three to four million times; they will have no rest, no food, no water.